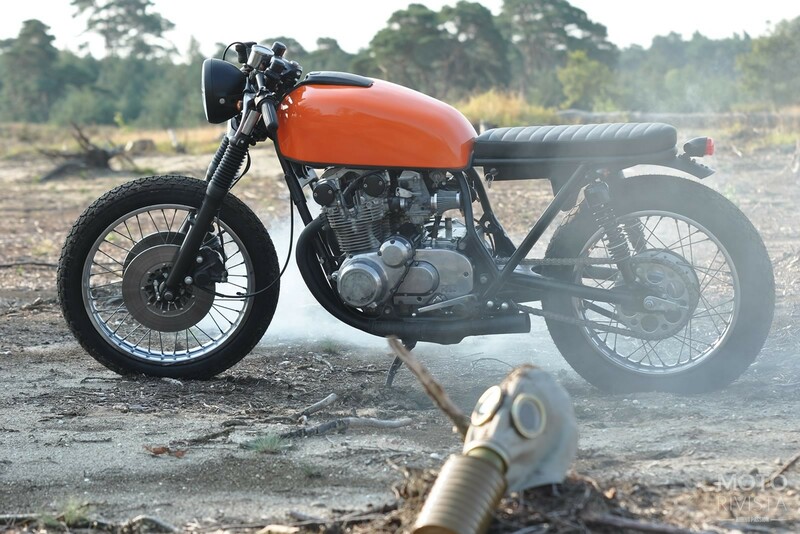 Today’s feature build a Suzuki GS550 aka Agent Orange by Left Hand Cycles celebrates motorcycle lifestyle and culture. The bike was a customer project for a famous DJ in Amsterdam called Lars. 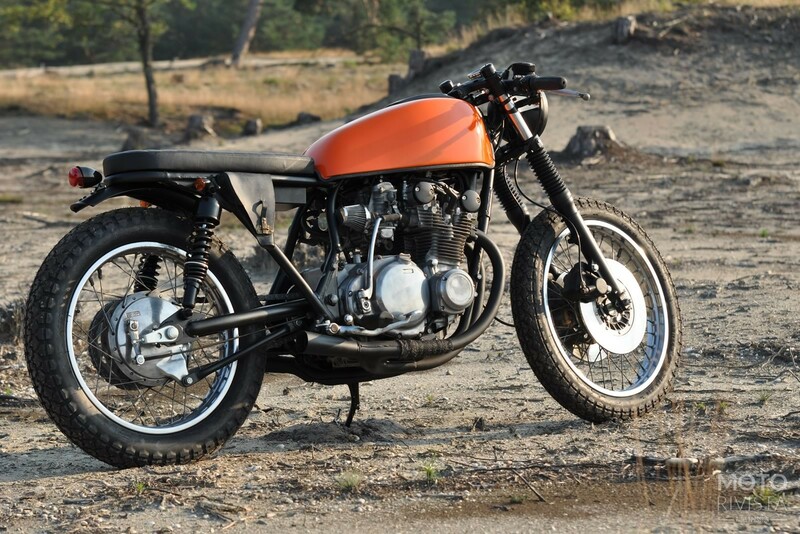 He was dreaming of a raw orange monster with the looks of a Cafe Racer. As luck would have it, the very next day while searching the web he discovered the brothers Richard and Lex at Left Hand Cycles. Lars contacted LHC with a question, could they build his dream machine with the style of a haunting acid train. The only condition was it had to be a four-stoke and it had to have a chemical orange tank. On the hunt and they found a neat original Suzuki GS550 in good condition, the perfect base for this custom project. The brothers took the stock Suzuki GS550 into their garage, and began to strip the motorcycle back. The grinder found it’s way to the frame and it was coated with an evil black is black coating. While the world slept the brothers worked all night till morning dew! The wheels are wrapped in Dunlop K70 tyres, the exhaust is LHC made and it sounds like a hunting Bison! Mean and full of anger! New electrics were made for a reliable “less is less” solution. Then Lars had another request, he wanted some flashlights and a horn on Agent Orange! The brothers were in shock! In the whole history of LHC there is no machine made with these goodies! But Lars was calm and convinced the guys, his planet was full of cars and other sorts of ugly transportation. After a couple of months the Suzuki GS550 took it’s end stage, it was ready to fire up for action. Lars took place on the new custom seat, his arms reached the clip-ons and he was lurking down the throttle. There is no doubt about the possibilities of the Suzuki GS550, it's a perfect model for Cafe Racers, Brat Style and Trackers. 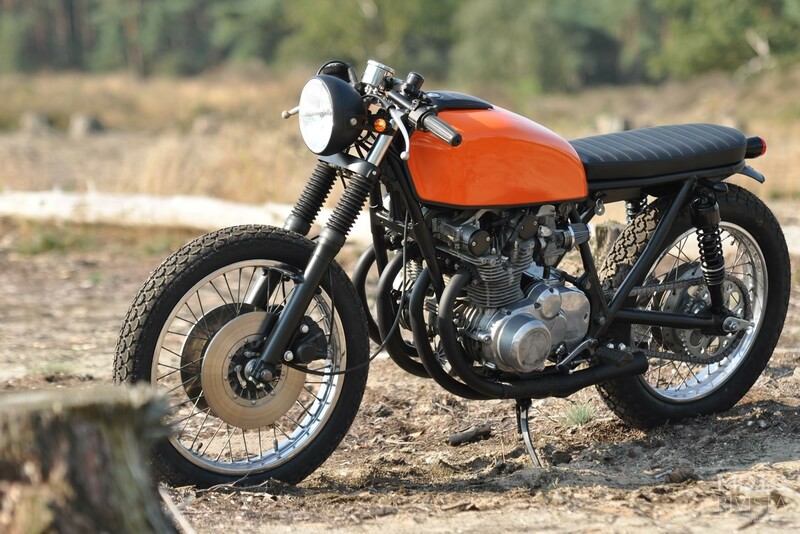 The finished Suzuki GS550 looks daring, while the use of Acid orange on the fuel tank gives you the urge to ride it. You can't go wrong with the mix of Black, Orange and soft steel finish, Agent Orange will serve it's purpose!